On the surface (i.e. 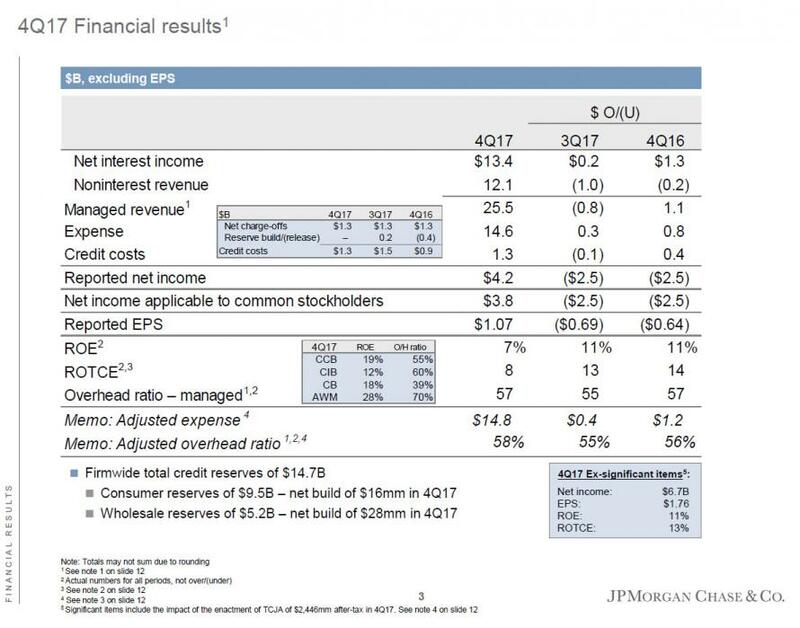 non-GAAP), JPM's Q4 results came in stronger than expected, with adjusted EPS of $1.76 (or $6.7BN in net income) beating expectations of $1.69, while "managed revenue" of $25.45BN was in line with the $25.51BN expected. GAAP EPS was far lower, or $1.07, as a result of a substantial $2.446 billion after-tax charge for the republican tax cut. JPM also reported that average core loans were up 6% YoY and 2% QoQ, while the bank's provision for credit losses was $1.31BN, below the $1.48BN expected. 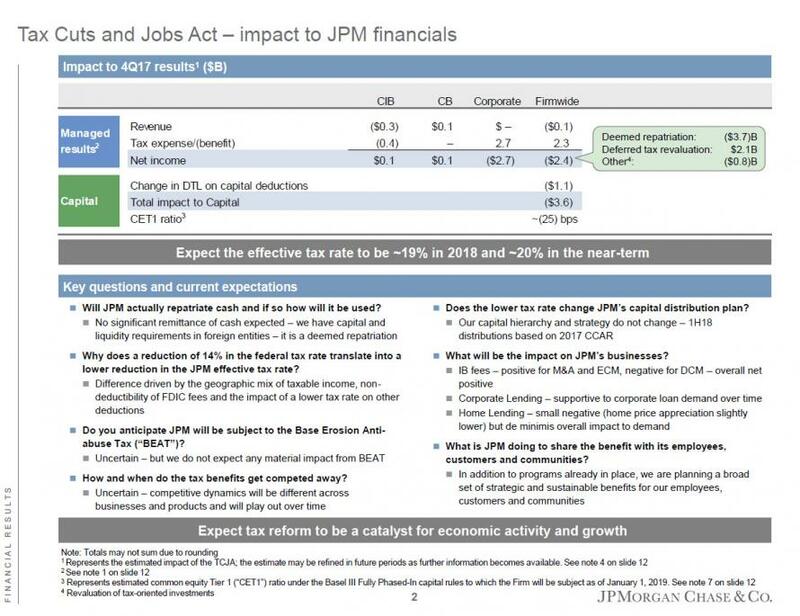 However going forward, in a detailed breakdown of how the TCJA will impact operations, JPM said that it expects the effective tax rate to be ~19% in 2018 and ~20% in the near-term. The company also stated that it expects "tax reform to be a catalyst for economic activity and growth"
Will JPM actually repatriate cash and if so how will it be used? Why does a reduction of 14% in the federal tax rate translate into a lower reduction in the JPM effective tax rate? What is JPM doing to share the benefit with its employees, customers and communities? While all of this was boilerplate, what was more interesting was the ongoing collapse in the company's trading revenues, which while expected to decline, tumbled in Q4 with total markets revenue down 26% to $3.4 Billion in Q4. Of note, Fixed Income Markets revenue of $2.2B, was down a whopping 34% YoY, although the number would have been -27% excluding tax impact. Once again, JPM blamed the record low volatility and the credit bubble, explaining that the decline was "driven by low volatility and tighter credit spreads against a strong prior year quarter." 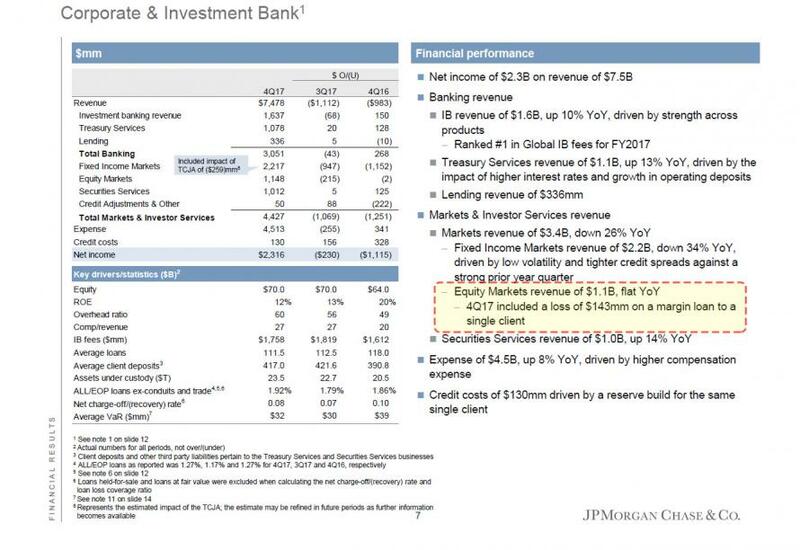 What was even more interesting however, is JPM's explanation that while Q4 Equity Sales and Trading revenue was flat at $1.148BN, the number included "a $143 million loss on a margin loan to a single client." JPM also said that it was subject to credit costs of $130mm driven by a reserve build for the same single client. It is unclear who the client, or what the nature of the loan is, and we expect this to be a hot topic on the conference call today. That and bitcoin of course. Markets & Investor Services revenue was $4.4 billion, down 22%, driven by lower Markets revenue, down 26%. Fixed Income Markets revenue was down 34% against a strong prior year, driven by continued low volatility, tighter credit spreads, and the impact from the TCJA on tax-oriented investments of $259 million. Excluding the TCJA impact, Fixed Income Markets revenue was down 27%. Equity Markets revenue was flat compared to a strong prior year and included the impact of a mark-to-market loss of $143 million on a margin loan to a single client. Excluding the mark-to-market loss, Equity Markets revenue was up 12%, driven by strength in Prime Services, Cash Equities and corporate derivatives. Securities Services revenue was $1.0 billion, up 14%, driven by higher interest rates and deposit growth, as well as higher asset-based fees driven by improving market levels. Rounding up the segment, Investment Banking revenue of $1.64BN was a $150MM improvement from a year ago, if below the $1.66BN expected. 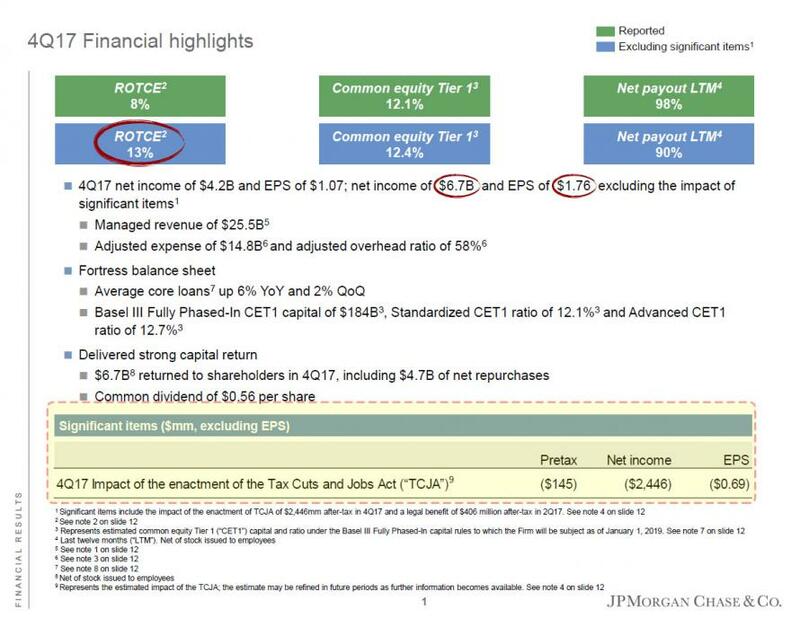 The good news for JPM traders: "Expense of $4.5B, up 8% YoY, driven by higher compensation expense." Translation: bonuses are going up. We said finally because this quarter's presentation was surprisingly thin, with little discussion of either credit trends, the company's NIM, or pretty much any other deep dive into the bank's balance sheet, something JPM has traditionally done in prior quarters. How did the market respond to all that? 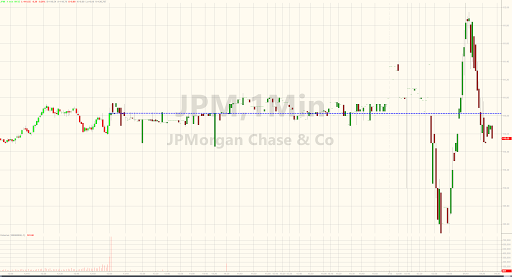 JPM stock first dropped, then rose, and is now unchanged. Full JPM Q4 presentaiton below (link).